Our cruise ship stopped in Ocho Rios, which is surprisingly close to the mountainside where the famed Jamaican bobsled team trained for the Olympics. We booked an excursion that included bobsledding and ziplining on Mystic Mountain while other members of our family headed to Dunn’s River Falls. I think we made the wiser choice. This was my first time ziplining and I loved it. 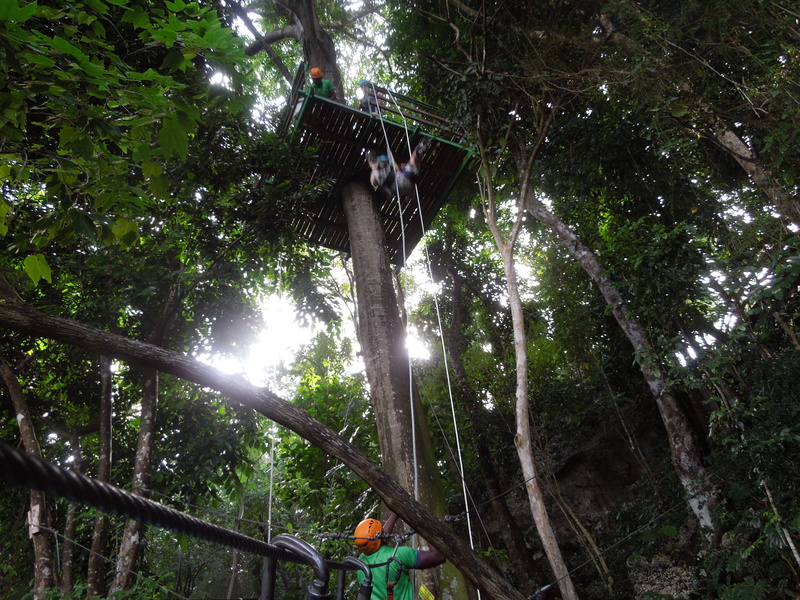 We ziplined across 5 platforms including one vertical drop. Our guides were so friendly and fun-loving. I felt safe every minute. We didn’t have to stop ourselves, which I learned is not typical, so perhaps this is more a beginner’s experience. Perfect for me. I loved the views. We saw the bobsledders below us, the ‘jungle’, and on the longest line, we could see the ocean and our cruise ship in the distance. Because ziplining ends downhill from where it starts, we had to get on the skylift again (included in the price) and ride it all the way to the bottom and back up to the top again. Along the way, we saw huge spiderwebs with spiders the size of my hand. Or we could look away and admire the ocean instead. Bobsledding was fun, but over more quickly than I expected. 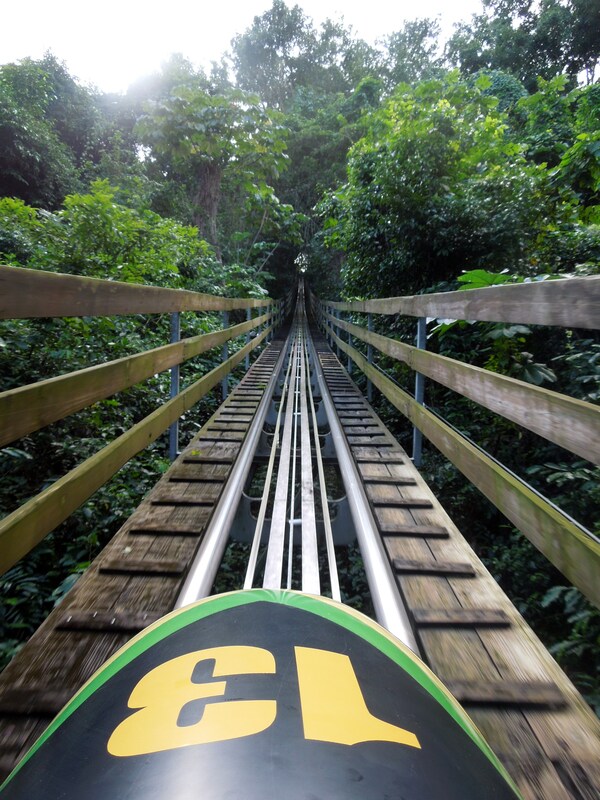 Once you get inside your bobsled, you control the speed as you careen down the track. We went full-throttle. I’m sure if we’d been on ice like it’s done in the Olympics, we would have been scared out of our minds. But this was on a track and was more like a short roller coaster, so no fears, mon. It’s over before you realize you’ve even begun. 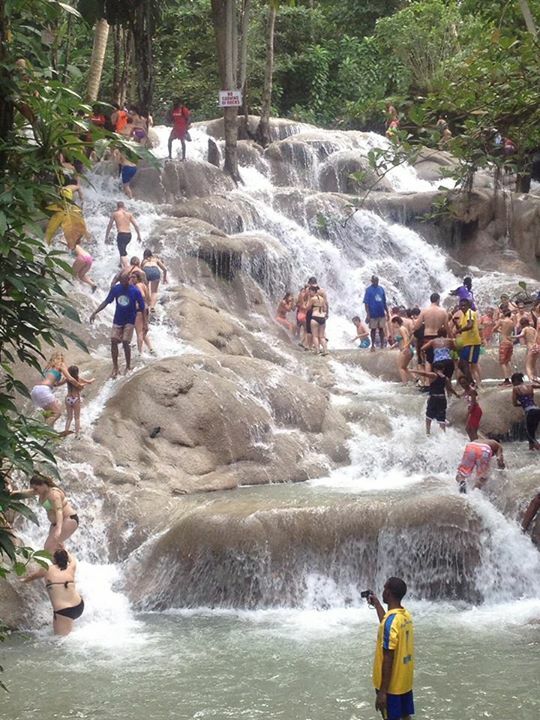 The Dunn’s River Falls was as disappointing for our cruise mates as we’d read it might be. The falls are very small and short and way too crowded to be enjoyed. What’s worse, though, is the aggressive scammers that congregate there. They offer to take your picture for you with your camera and then demand a tip to get it back. They take hold of your hand and put objects in it, almost insisting that you buy those objects now that you’re holding them. My stepsister’s preschool-aged kids had wooden toys put into their hands and then the Jamaican seller starting carving their names into them. My stepsister never agreed to buy these items and refused to do so. It made the whole experience miserable for them. We were glad we stayed on Mystic Mountain instead. The poverty in Jamaica gets to you quickly. If you stop here, expect to be approached by several friendly Jamaicans who will offer to do almost anything for you in return for a tip. Have you ever been to Jamaica? What was your experience like? Been to Puerto Rico and Bahamas but not Jamaica. I loved Puerto Rico. Much more than Jamaica and the Bahamas. Wow! That looks like so much fun, especially the bobsled part. Never been to Jamaica personally. I’ve heard mixed things about it, but most of those people were holed up in all-inclusive resorts, so they didn’t even see the place. I hear a lot of mixed reviews, too. I haven’t met many people who like it. The city was rundown, but being in the jungle was beautiful. The bobsled was fun. Wish I could try it on ice! Our trip to the Bahamas was similar with the begging. Wealthy touristas; poor citizens. Doesn’t usually happen here at home. Makes one not want to travel. But, there you have it. It does get wearing. I never know what to do. I can’t save everyone and the beggars just keep coming. Sounds like quite an adventure Juliann!! I would love to try ziplining before I die, preferably withoutsans the spiders or the scammers 🙂 Wonder if there is a cut off age? I don’t think there’s a cut off age. If you’re adventurous, you’re in! It was a lot of fun. The platforms on these zip lines were pretty big, too. I’d worried about standing on a tiny deck way up in the air, but didn’t find this scary at all. The harness attachment alleviated most of my fears. That sounds nice. I’d like to see some other parts of the island. 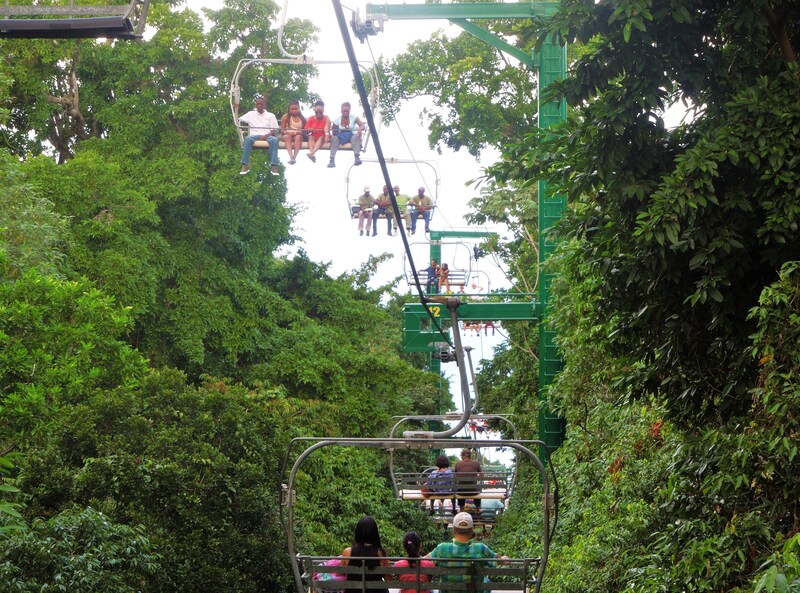 A cruise AND zip lining – both on my bucket list. And we’re ticking off “cruise” this November. Loved “visiting” Jamaica through your experience! I hope you love it. November sounds like a great time for a cruise. Not too crowded and warm weather right when winter is about to begin. Never been to Jamaica myself but I’d go now, only for the bobsled experience and the great zipline! I felt like zooming along on a Jamaican bobsled was just too much of a unique experience to pass up. I never guessed that I’d like the ziplining even more. Love ziplining! Can only imagine the thrill of being in a bobsled! OMG. No to the thrills and the waterfall, yes to the music and the cricket. As a whitey I’d probably need a local minder but I’d love an evening in a Kingston ganja joint listening to a local band. LOL. Wish we’d had time to listen to some reggae while we were there. Oh wow that looks absolutely gorgeous. I haaate it when people pull that scammy crap, and using kids to do it is disgusting. 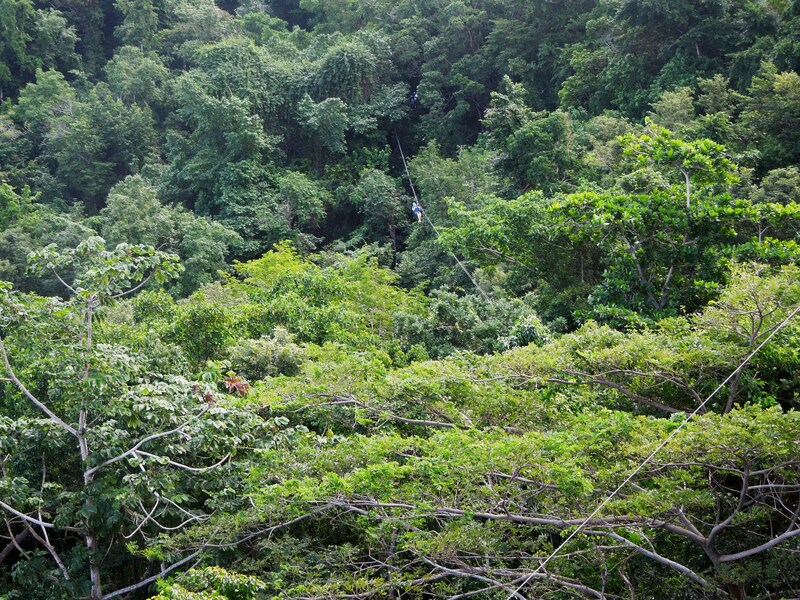 The ziplining looks super fun though! I hate it, too, Stacey. It detracted a little from our excursion, but the zip lining was wonderful.